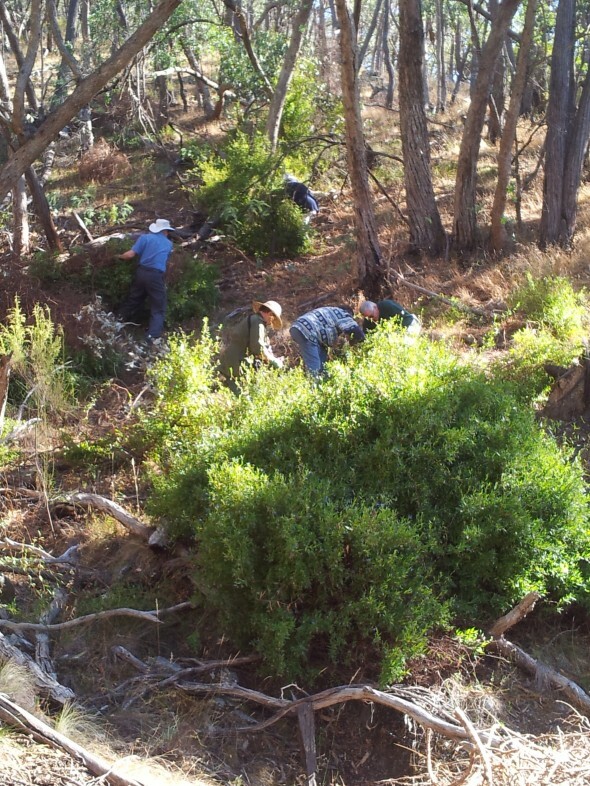 Last February 23, 2014 a big push by a group of us really set back the invasion of Bluebell Creeper (Solly heterophylla) taking place in the North/East Bushlands. A further onslaught in November 2014 is planned and details will be posted here. This entry was posted	on Thursday, January 30th, 2014 at 8:13 am	and filed under • Events, • The bush, Weeds and pests. You can follow any responses to this entry through the RSS 2.0 feed. 15 of us met to take on the task of taking out the creeper. It is not an easy job as the plant grows anywhere and everywhere with a particular liking for inaccessible slopes. Much work was carried out on Lot 12, Jo and Paul Maher’s place, and was then continued on Municipal Reserve #1. We will have to return in a few weeks to see what was missed and to complete the work for this season. A very big thank you to all those who participated. This is an essential job if we want to keep invasive species out of the Bushlands, and the efforts of the volunteers is greatly appreciated by all. We now have to come up with the better name for the Reserve…any suggestions anyone?